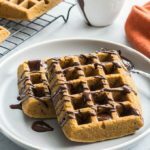 Grain-Free Pumpkin Chocolate Chip Waffles are fluffy, filling and perfectly spiced for the season! And they’re made with almond and buckwheat flour, so they’re not only grain-free, but gluten-free too! Pre-heat oven to 350F and grease a 6-waffle silicone mold. (I also place the mold on a baking sheet for stability). In a medium-sized bowl, sift together the almond flour, buckwheat flour, coconut sugar, pumpkin spice, baking powder and salt. Set aside. In a small bowl, whisk together the milk, oil, pumpkin and eggs. Add the wet mixture to the dry ingredients and stir until just combined. Stir in the chocolate chips. Pour the batter into the silicone mold using a spoon to spread it out evenly. Bake for 20 minutes or until the waffles are browned and firm. Remove from oven and let the waffles cool in the mold for a few minutes before turning them out onto a wire rack to cool slightly before serving. Serve warm with melted dark chocolate, maple syrup and/or coconut cream. Store any leftover waffles in an airtight container on your counter for 1-2 days, or freeze for later enjoyment. You can use light or dark buckwheat flour. I prefer to use light so the colour of the pure pumpkin is more noticeable. These waffles were baked in a silicone mold but a waffle iron would work too. Just be sure to adjust the cooking time according to your waffle maker.